American Arts & Crafts Brass Tea Caddy, octagonal with domed lid, hammered and engraved button decoration and raised on ball-and-claw feet. Circa 1900. 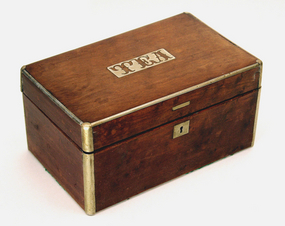 Antique American Tea caddy in maple with pewter stringing and a pewter plaque with the word "tea", inside are two lidded compartments. Circa 1870. 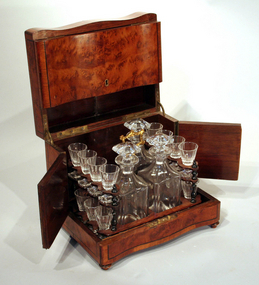 Exceptional Burled Walnut cave-à-liqueur having hinged top and front panel opening to an interior with removable tray fitted with gilt decanters and glasses. French, late 19th century. Early Staffordshire transfer decorated plate of Christ Church, Oxford by J & W Ridgway, circa 1814-30. 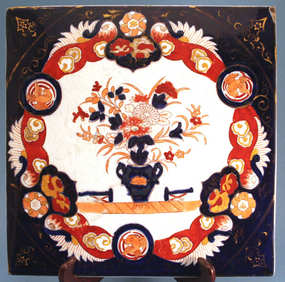 Antique English Papier Mache Tazza with circular foot and scalloped rim and gilt and silvered Japonisme decoration of figures in a landscape on a black lacquer ground.. Circa 1870. Antique English Brass and Copper Coal Scuttle by Griffiths & Browett; of helmet form retaining it's original shovel and with a stamped makers mark "Griffiths & Browett, 1877, Birmingham" (scratches and dents from use, kindling not included). 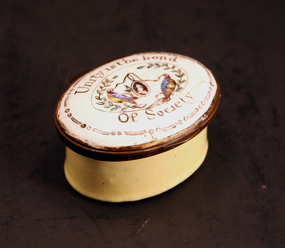 5218-21: English, Bilston, late 18th century, patch box these memento boxes were popular at the end of the eighteenth century and frequently given as tokens of friendship and love. Usually oval in shape, but also circular and rectangular, there decoration reflected the popular styles of the day. For example, by the 1790s Neoclassical style swags, doves, hearts, and borders were the most commonly used decoration of the day. This box reads "Unity is the bond of society." 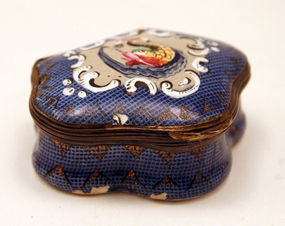 Heart shaped enamel box, most likely French, 19th century. 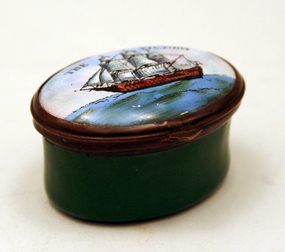 Major restoration to lid, and loss of color to lid, sides and bottom.